Taking the KTM Tanjung Malim to KL Sentral Komuter Train is a cheap way to travel, with many services a day taking you to the centre of the capital. Commuter trains run every hour or so from Tg. Malim railway station, taking around one and a half hours to get to Kuala Lumpur Sentral railway station. Please Note: Due to line upgrading work, there are just a few commuter departures a day that travel from Tanjung Malim to KL Sentral all the way. Commuter trains in Malaysia are very much like subway / tube trains in other countries. Seating is usually down the sides of the carriages, with standing room in the centre of the cars. When they are busy, you may find you have to stand for part or even all of the journey. There are no toilets or other luxuries on-board. They are just to get you from point A to point B as cheaply as possible. The other, more comfortable option to travel by train from Tanjung Malim to Kuala Lumpur, is to take one of the faster Electric Train Services (ETS). When you travel on an ETS Train you have your own reserved seat, so making the journey to KL much more comfortable. ETS Trains also stop at fewer stations and travel faster, but are more expensive. All services on the Ipoh to KL Sentral ETS route stop at Tanjung Malim and are the best trains to take. Other long distance ETS services also stop here, but seats are usually harder to obtain. The KTM Komuter cash fare for trains to KL is currently 10.40 MYR. Tickets for these services are only sold on the day of departure - no advance booking is necessary or available. 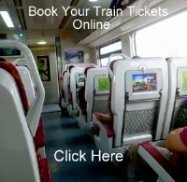 If you want to take an ETS service, you should book your tickets in advance as they can often be full.